There was once an old abandoned cottage in the middle of the California countryside. It had broken windows, light bulbs hanging from bare wires and a house full of unfinished ceilings. But that little cottage talked me and begged me to give it a chance and to see what it could be rather than what it was right now. You know, honestly, the damage and disrepair in this cottage was hard to overlook. But for some reason, I didn't see that as much as I saw the potential. 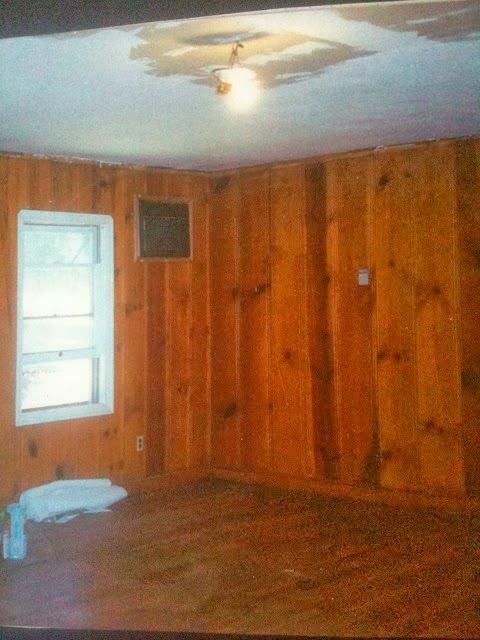 The wood plank walls, the hardwood flooring throughout, the 8' wide original fireplace and those old kitchen cupboards. Of course I saw all the damage and huge amount of work- but that wasn't what stood out. I saw what the cottage could be with a little bit (okay- a lot) of work. And one of the many things on the list of to-do's were the ceilings. Somewhere in between the 1940's and the the 2000's - the original ceilings whatever they were - were replaced with sheetrock. Except for where they weren't replaced and were left open to the attic. Well, that sheetrock was unfinished. As in- gray, dull, paper covered sheetrock with a little bit of taping here and there and paint- not texture. Just paint. That is the dining room when we moved in. and that lightbulb hanging from a wire? Well, let's just say it was replaced with a little more bling. You can also see the unfinished sheetrock ceiling. 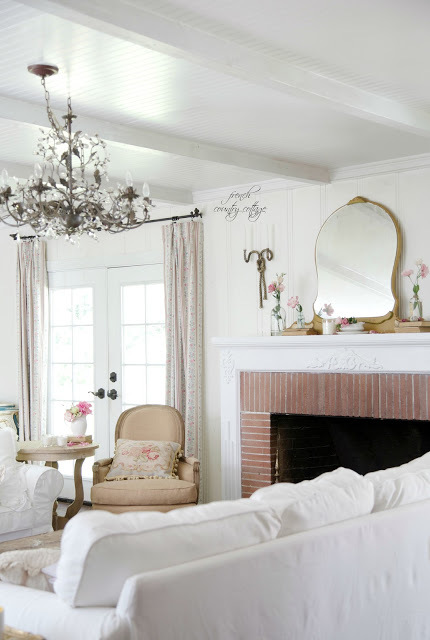 Taking a cue from those wood plank knotty pine walls- I wanted the ceilings to feel like they were a part of the house that had always been there. 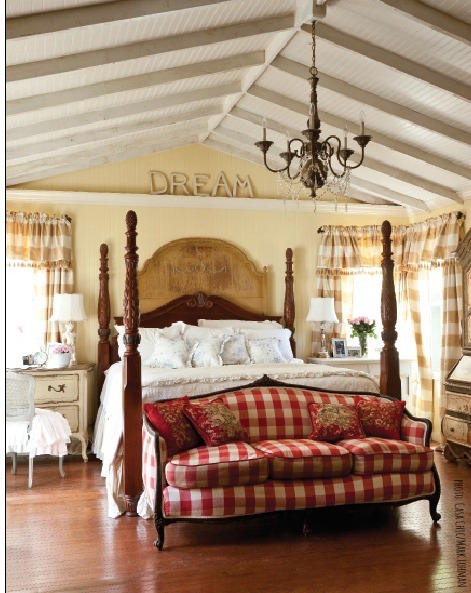 And so- we used bead board and beams to create the look. 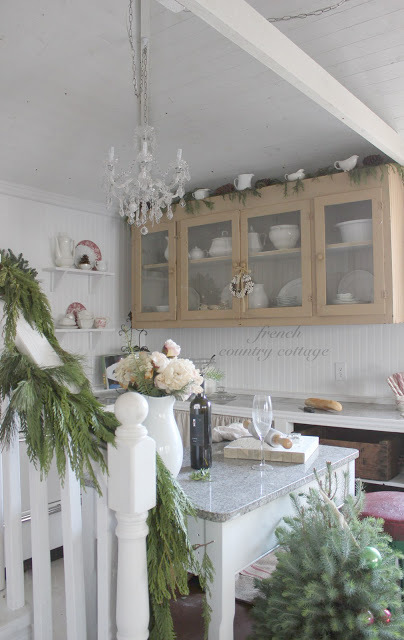 So many of you have asked me to share a bit about the ceiling how-to. Bead board is not difficult to install - but you do need more than one set of hands to make it happen. You can either use individual boards that you slot together or use the sheets of faux beadboard. If using the sheets- the easiest way to maneuver those heavy sheets is to cut them into manageable sections. For example- in the living room- they are cut in half into 4' long sections. We knew that we would be adding beams over the seams so that was a no brainer for cutting them. But if you are not going to be using beams - I would recommend you invite another 3 friends over and use the whole sheet because those seams will stand out like a sore thumb. Make sure to nail and/or screw into wood along the rafters. sheets of beadboard are heavy. You can also use a bit of liquid nails on the sheets for extra strength. When putting up those sheets- that is where you need some extra oomph and extra hands. Find the biggest muscles in the neighborhood and invite them over for a cup of coffee and to hold the sheets in place while you secure. so make sure you have reinforcements to help out or wait until you do. We used 4x4's for our beams in the living room and kitchen. They are real and they are heavy and if they fell could do some very serious damage. My dad is a contractor - so we have a bit of a bonus in that he knows all the details and how to's and help with installing something like a big piece of wood on the ceiling. they are put up correctly. In the cottage- we took a different approach. We used thin pieces of grooved wood on the ceilings. It was much easier in my opinion and much preferred as well. They are not heavy, simple to cut and simple to install. You can find them at Lowe's. I like a more glossy paint on the ceiling- but that is personal preference. but you can use whatever you like- and most paint stores recommend flat paint I think. so I avoid any tints of color or anything else. But if you have a nice height or peaked ceiling it could handle something with a bit more pizazz. We actually just did another planked ceiling in the house that is a little different than the others. I will share all the details and how to's on that one soon. I hope that helps answer some of your questions! Always love seeing your little cottage and what you've done with it. Per se may refer to: Per se (terminology), a Latin phrase meaning "in itself". Your home is so "dreamy" and beautiful. 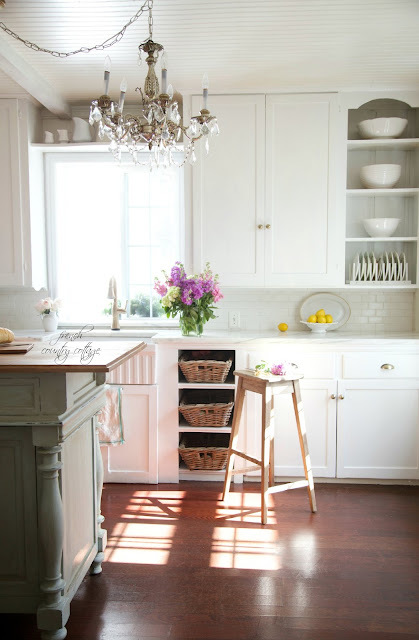 Did you always love this shabby vintage style or did you discover you loved it after trial and error? My house is such a Mish mash of stuff because I have yet to truly find my style. 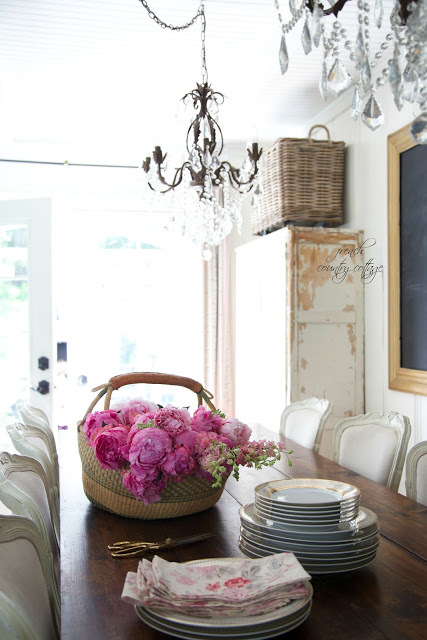 Sometimes I love cottage / coastal, sometimes more modern, other times I love your beautiful romantic style. I'm just so confused. For one thing I know, I love white and light colors. Well maybe it's a start? Oh. 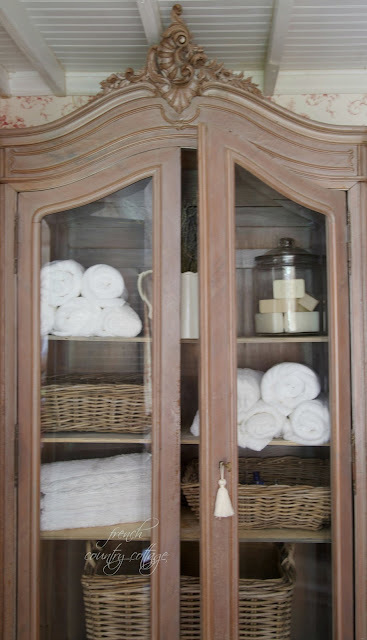 And I absolutely adore your linen armoire. I've always wanted something like that. Gorgeous. What pretty ceilings! I like the glossy paint you used. 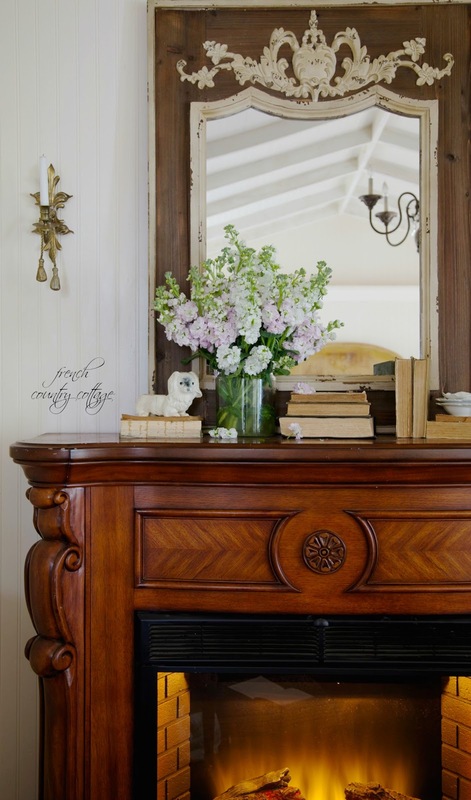 I loved reading about how you turned your cottage into your beautiful home. I also enjoyed the description of enjoying the "floating feel," of the ceiling. I have mentioned before that we are building our "French Country Home," and I am going to use your recommendation of a glossy planked ceiling. Thank you! Gorgeous... I'm so glad you saw the potential and made it back to the 'love'. So enjoy your blog. The ceilings makes such an impact on all of the rooms....plus the chandeliers!!! truly amazing..
You have done the most remarkably beautiful changes to you cottage and its hard to equate the 'old house' with the new!! Its all absolutely beautiful Courtney!! Great information! Thanks, Courtney for your tips! I love planked everything! It gives it such a cozy homey grounded feel. You have done an amazing job putting this cottage together! You should be proud! Dripping with talent you are! Oh Courtney - I have so much hope when Isee your beautiful home ! We bought a fixer upper last year and I'm nowhere near where you are but this makes me feel maybe we didn't make the mistake of our lifetime. LOVE everything you've done !